My urban garden was featured in the House & Home magazine a few years ago as well as in as a video from House & Home online TV. With Spring just around the corner( I hope! ), now is a good time to look back at be inspired by my blog “Creative Retreat” describing the story behind my European inspired courtyard. Scroll down to see the full blog. Theresa Casey in the lower courtyard of her eclectic garden. The May 2014 issue of House & Home features an inspired courtyard garden designed by Theresa and her husband, Robert. Not only is it beautiful, it serves a variety of functions - eating and entertaining, relaxing, gardening and creating art in the studio. To achieve this, four zones were planned: an upper terrace, a lower courtyard, a cozy sitting area and an artist's studio in the underused garage. A rich layering of textures, such as stone, brick, wood, iron and lush planting beds create a visual and sensory oasis in the city, reminiscent of European courtyards nestled in small, hidden urban spaces. If you are interested in more details about the story behind this urban retreat, check out the May 2014 issue of House & Home. Below you will find a few shots showing the construction of the garden and scenes from the magazine photo shoot. Theresa's husband, Robert, mapping out the lower courtyard, following the plan's outline of the upper terrace/dinning area. The garden, stripped down to its bare elements - including the single slab stone bench at the back - before weathered stone was laid for the floor and steps up to the terrace. 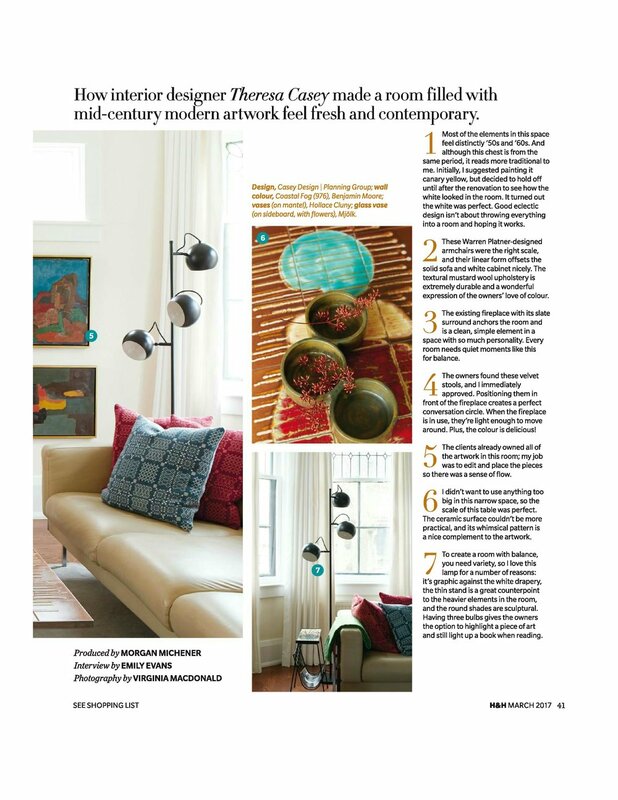 Casey Design/Planning Group is featured in the May 2014 House & Home "Inspired Home" issue. The garden in full growth after the reconstruction - seen from the back - with the salvaged fountain centered in the lower courtyard. 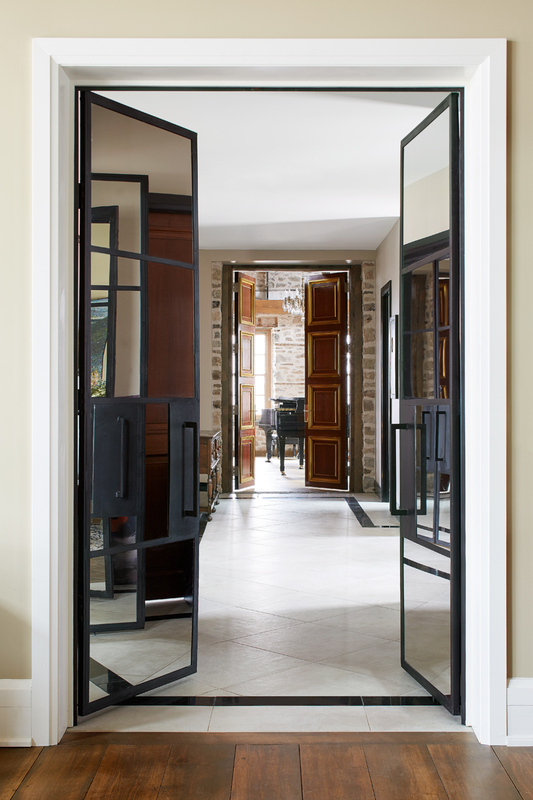 Egyptian Deco doors lead into Theresa's studio from the stone courtyard. Once a garage used for storage, the studio features exposed brick, salvaged antique French clay tiles and wood beams that create a sense of age and character. The walls and tables are adorned with found objects and inspirational images from Theresa's eclectic collections. At the photo shoot, photographer Donna Griffith checks her lighting and image cropping before taking her superb photographs. The end result - a lush, romantic and inspirational courtyard that welcomes many different uses and acts as a "growing canvas" for the designer's ideas and creative experiments. Pear Tree Farm Project wins inaugural IDC and ARIDO awards for Excellence in Design. We are very pleased to announce that on September 18th, 2018, Casey Design|Planning Group was awarded the 2018 inaugural Value of Design Award of Excellence (VODA) for Residential Design by the Registered Interior Designers Association of Canada (IDC) for the “Pear Tree Farm” project in Milton, Ontario. The project is also the recipient of a 2018 ARIDO Award. Please scroll down below for photos and project description. Our design for my client’s beloved 1850’s stone farm house in Milton was featured in the National Post Newspaper. Attached is the link to the article from March 31, 2018 (bit.ly/1850sStoneFarmhouse) and as well I thought I would share some before and after photos and an insider view of the concept and process. This project is about the resurrection of an 1862 Regency Georgian stone farmhouse, a designated Heritage Building, and its adjoining structures destroyed by a massive fire in 2013. The ruins of the property sat exposed to the elements for close to two years and became saturated with moisture and wood rot, requiring a complete rebuild and restoration. The farmhouse had been in the family for many generations and now it was a gothic ruin, like Thornfield Hall in Jane Eyre. But, there was something about the place, a spirit of sorts that made the project much more than just a renovation. The client, a classical pianist, wanted to retain as much of the original character of the farmhouse as possible, while needing formal living, dining and kitchen spaces, as well as a family room, a private master bedroom suite, multiple bedrooms with ensuites for children and guests, a library/office, a potting shed, a games and AV room and lastly, a large concert space for public gatherings to showcase her two grand pianos. The challenge was to achieve a high-end result within a mid-range budget, given the limited payout from the insurance company. Additionally, we needed to adhere to Heritage Department requirements, address long-term sustainability issues, provide maintenance solutions and consider the future saleability of the renovated property. Client specific requirements were to address acoustical conditions for concerts and heat control for instruments. Our concept created a contemporary reinterpretation of vernacular historic farm homestead. By introducing modern forms and materials to complement/contrast with existing heritage elements, we juxtaposed the old with the new, giving each their cultural and architectural precedence. The property originally featured 2 stand-alone stone buildings; the original 2 storey stone homestead (stone building above far right) housed living space on the main floor and bedrooms on the second floor and a smaller stone outbuilding, possibly the original stables (stone building above far left). Our concept (and finished result above showing connecting space stone buildings) was a new take on a traditional farmstead: to join the two existing stone buildings with a contemporary central section thus creating the experience of a rambling collection of farm buildings. The Historic stone juxtaposed the metal standing seam roofs of the 'allegorical' barn structure and further contrasted with contemporary Ipe wood slatted facade of the contemporary middle structure, reminiscent of aged barnboard walls. Before the construction began, a local contractor who specialized in stone house restoration, worked to strengthen and repair the shell; once the heavily damaged plaster and lath was removed, the beauty of the old walls was fully revealed and we opted to keep them exposed. This provided a visual history of the farmhouse structure with “ghost” traces of original details. Lastly, the exposed stone walls provide acoustic value, textural and visual warmth. A new heating system introduced high velocity currents of air from the energy efficient geothermal system (sustainable). A music concert space was located in the previously two storey farmhouse and the newly open, dramatic space also doubled as a formal salon/living room. The contemporary addition housed a large open concept kitchen, family room, library, games rooms and numerous bedrooms, while the stables became the master suite. As a passionate gardener, one of my client’s favourite rooms is the potting room. With traditional black-and-white checked floors and a big side counter for dividing perennials and potting up geraniums. The doors to the potting room are a pair of lacy old Victorian French doors that my client found at a local flea market. 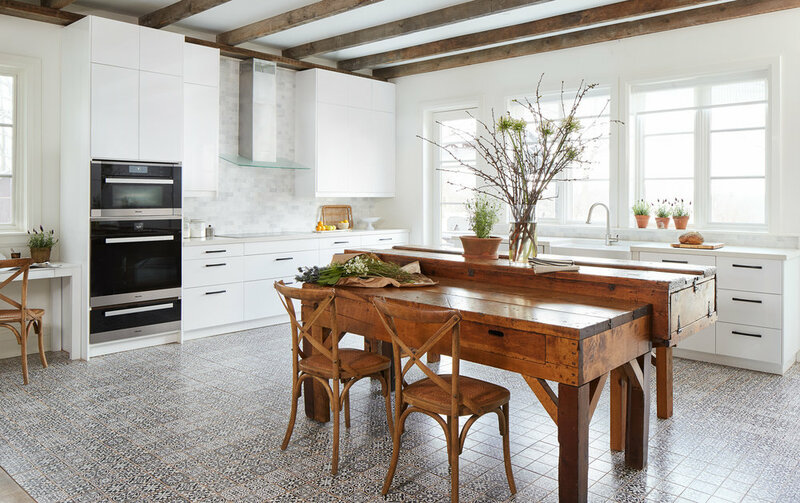 Though it is modern and clean, the kitchen has its own sense of the past, with reclaimed timber ceiling beams, and in place of a central island I incorporated worktables found in an out building. The use of antique, one-of-a-kind furniture, mixed with contemporary elements is one of my favourite combinations because the warmth of the old plays off the clean lines of the new. Handy drop spot and bar area flank large storage pantry and double door fridge. 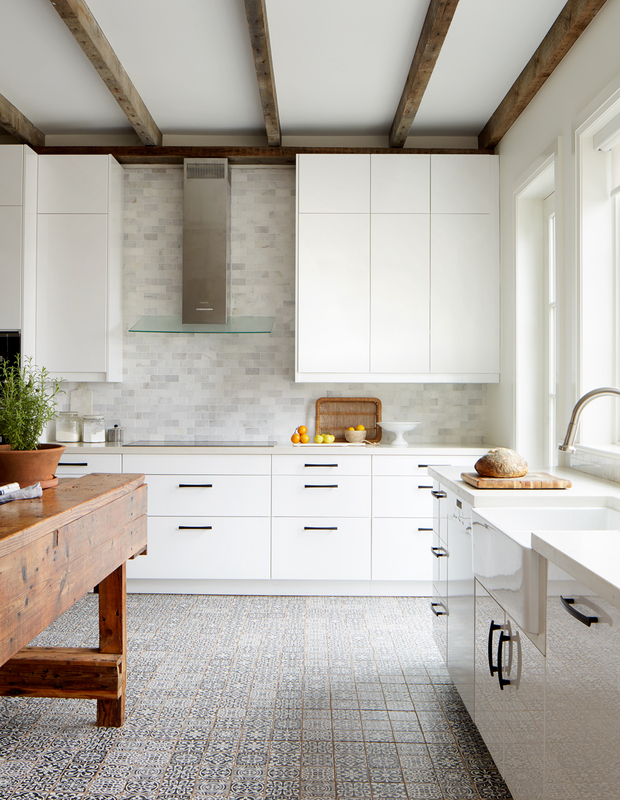 Vintage inspired floor tiles add to the modern chic farmhouse vibe. The kitchen office (above right) is a different kind of sanctuary as it overlooks a huge vegetable garden - a nice spot to ponder recipes for soup making or canning. Below are images of the work in progress of the Farmhouse. The burnt out shell of the farmhouse. The original Italianate entry door and historically original frame with side lights and transom which we restored and reinstalled shown above post fire. Note the stairs that were removed to create the open concert/salon space. Construction of the new linking contemporary addition. In process: the restored stone walls on the right and the damaged walls still on the left to be worked on. Also, see the cut off 2nd floor joist, new metal struts and new vaulted ceiling clad in warm stained wood. The joists were re-used throughout the project including in the kitchen ceiling. In the final solution here we installed hidden perimeter lighting inside of reclaimed wood valances. Old and New Architecture in Toronto, Leslieville & 6 Tips on Historic Renovation. 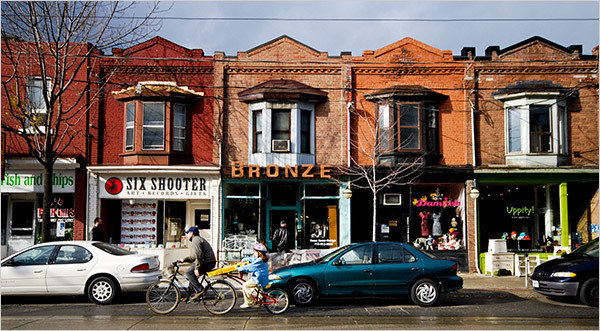 Leslieville, an east-end neighbourhood in Toronto is considered to be one of the city’s most popular places to dine, drink, shop and live. However, 20 years ago you would not recognize the area because it was heavily industrial with a concentration of factories and warehouse buildings often housing my friends from art and design school. Today, with the changing to the residiential building zones those warehouse buildings have been renovated into beautiful loft apartments and shape the character of the main streets; Carlaw Ave., and Gerrard Street. The old architecture remains deeply connected with Leslieville's history and identity. Like all historically significant buildings in Toronto, properties are protected against demolition or significant alteration of the facades as described in the Heritage Act. In this blog, we give a few tips on how to navigate renovation in historically significant buildings like those you find in Leslieville. This blog is a snap shot of our process in relation to historic buildings. A collaborative, team approach ensures that both our vision and the client’s vision come to life. Each project is spearheaded by Theresa Casey. We work to establish communication lines to work directly with our client's needs, including how these tie in with the requirements of historically significant buildings in Toronto. 2. Working together on one vision. 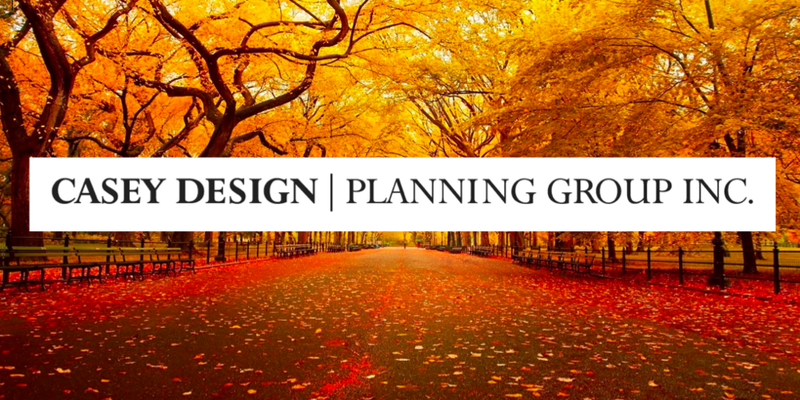 We work with clients on all phases of the project, including: budgeting, design, space planning, detail development, material selection,project management, furnishings and accessories and final implementation. 3. Don’t be afraid to play. There is a lot of opportunity to do playful things, while also keeping the integrity of historical spaces. This means being able to combine contemporary design that compliments historical architecture. 4. Preserve the street-view façade. We work closely with the architect to ensure the street-view façade is maintained as they are protected by Code. Maintaining the character is paramount to maintaining the neighbourhood’s identity. Leslieville today has the Arts and Crafts Bungalow style housing as well as the Toronto Bay-and-Gable styles of the 1880s. 5. Budget the time needed to replicate era-appropriate details. Custom-made details take time, especially those that need to adhere to era-appropriate styles. Casey Design is experienced in creating details that both compliment and replicate the era in which historical properties are built. 6. Old architecture needs love. With historical buildings you never know what kind of problems from the past you could encounter – such as moisture problems, structural problems - anything is possible with old buildings. The first element of a historical renovation is giving the place a lot of love! We work with the architect to make sure existing buildings are restored (where needed) and fit for renovation. Below are some historical photographs of the architecture in Leslieville, Toronto. More historical imagery of Leslieville. Old industrial chimney stacks (left) and view of Carlaw and Gerrard looking north, in the 1900's (right). Sharing our highlights of January - August 2017! This year Casey Design Group has created some very exciting projects, that we would love to share with you in this blog! This renovation “gut” in the Toronto neighbourhood of Riverdale was inspired by my client’s art collection – taken mostly from the 1950 & 1960’s British Expressionist Movement. The home is a classic Toronto Victorian featuring lovely bay windows and as you can see, art abounds! The key to the success of all my work is to address functional & spatial issues with a well thought out floor plan and layout. Many clients have heard me say that this is the most important part of a project. This involved the following: moving the location of the powder room, creating a master ensuite in a former sun-room, moving the too small 2nd floor laundry room to a guest ensuite and an entirely new third floor ensuite. As well, I designed new layouts for the kitchen and located a new large laundry room/storage room in the basement. Stylistically, I married mid-Century modern furniture with contemporary elements to make this a more than unique home filled with personality. Partnership with Cosentino Group, Kohler Kitchen Fixtures and Benjamin Moore Paint. My "dream kitchen" below has all the elements that I love in good design: functionality, connection to the outdoors, intimate and grand spaces, texture, beauty and drama. This image in particular received an astonishing 2,000 likes on the Benjamin Moore Instagram page! “I think it is very important to have objects that surround you that have meaning and connect you to where you come from. 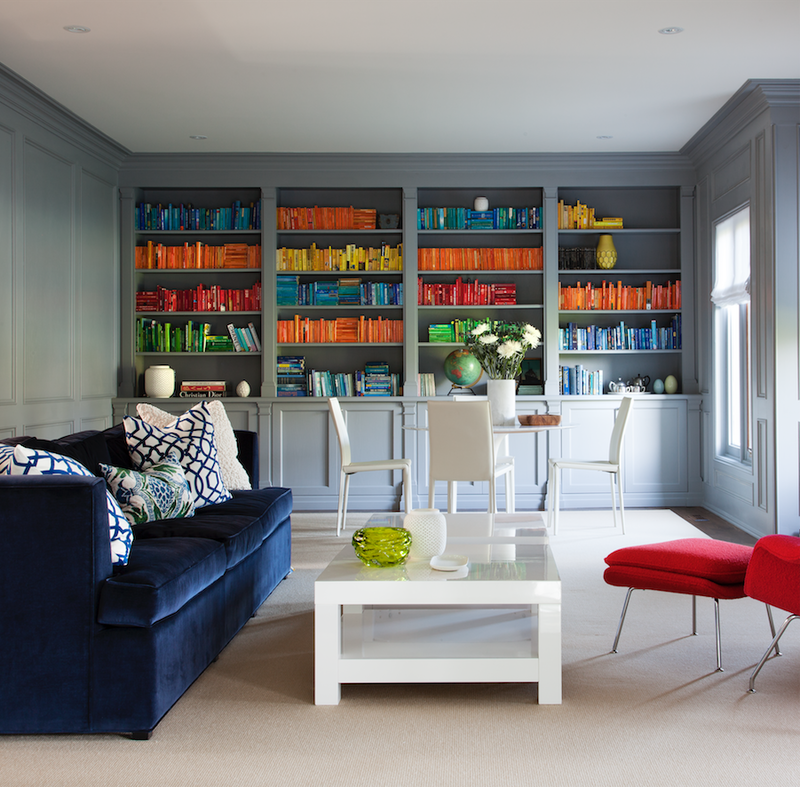 This space blends vintage objects with the client's love for books, highlighting the need for hand-made and rustic mementos in a modern contemporary space”. For the third year in a row, I am honoured to be part of the Advisory Committee for the new Integrated Design program at the Haliburton School of Art and Design. I have spent many hours up in Haliburton taking Fine Art Courses so it was a natural fit and plus the inaugural Dean is “Uber Designer” Barr Gilmore - the much lauded and honoured Dean is known for his exhibition designs at TIFF- such as Fellini and Tim Burton as well as Graphic Design projects with Bruce Mau and clients such as Gagosian Galleries. Canada’s only museum dedicates exclusively to the pursuit of design excellence and preservation of design heritage. I am on the Board of the Volunteer Committee at the Design Exchange and support the extraordinary design expo Edit currently on in Toronto until October 8th, 2017. The brainchild of maverick DX President and CEO Shauna Levy, has brought together world class thinkers to showcase “an edit of real-world problems”. Located at a former 5-storey Unilever factory, it features exhibits and talks on key themes: Shelter, Nourish, Care and Educate. It is a brilliant show and I encourage everyone to go and see it. Below are some sneak-peaks into projects that I am working on currently. 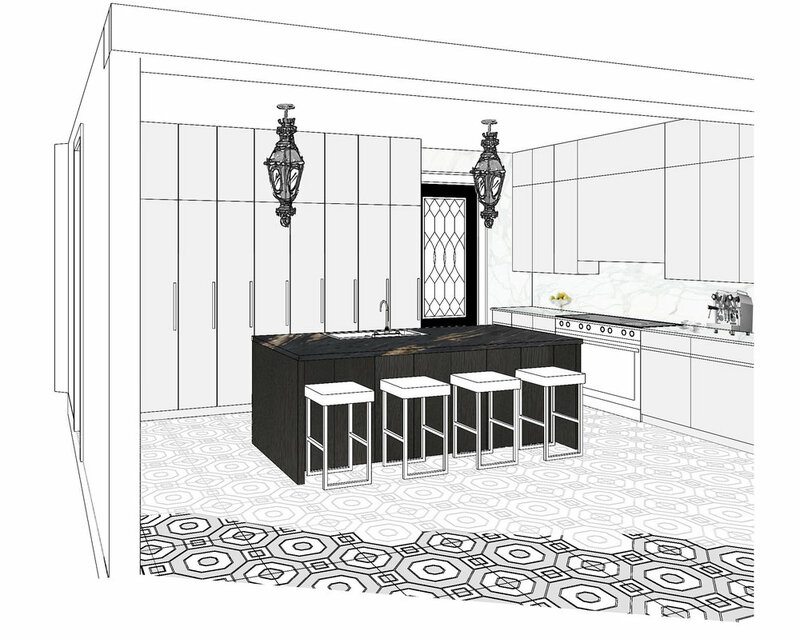 Midway through this renovation of a Historic Rosedale Home, this sketch shows an ultra-modern kitchen by Italian company Boffi in combintiation with period details such as 2 antique Edwardian light fixtures (originally exterior sconces that I am having retrofitted for pendants) and a custom designed marble mosaic floors. I am so excited to see this installation soon! Renovated condo in a former school and heritage building. Sneak Peak of just one of the custom design elements in this stunning condo: a 12’-0 x 12’-0” brass folding screen. First shot is from the studio when it was being built. Second shot is the painstaking installation. Last, a peak of the finished screen!